It is but I wouldn't do anything to it unless I know for sure its safe. Maybe if its some sort of other liquid that cleans but doesn't degrade the internals. ISO is a bit harsh. Well Im just not sure you should get those wires wet at all with any solution. I dont think Seb woukd recommend that. He would dismantle, then clean and replace (or...replace lol, I just clocked that double meaning of that word in this case) after cleaning the glass, in some sort if oven method for him which prob gets all that heat soaked browning out of the glass too. Sorry if Im confusing things Im well sketchy lately not been sleeping much, too cold so Im in a bit of a dreamworld. I wonder how tricky it might be to take it apart for cleaning and put wires back snug after? I will have a closer look at my injector but I am no handiman. maybe a vaccum for a mouse? Ok this is just physics and chemistry. I think its all glass, stainless tube with ceramic. As far as I know they are safe to be wet if it doesn't touch the cord. Maybe we should ask Seb? I emailed the info@herborizer email to ask. okay Im intetested in this for sure. He just got back from Morroco yesterday so he may take a while to respond, but he usually does without fail. Please keep me posted man. I may ask him myself depending on your progress, I gotta book the re-return of my DigiTi asap anyway so I'll be chatting with him over that. Herbo Digi Ti landed this Saturday morning. Talk about a happy “end of the month” ending. A beauty on its own. Sitting at the Glass Symphony stand, mixed in between the rest of the lineup. 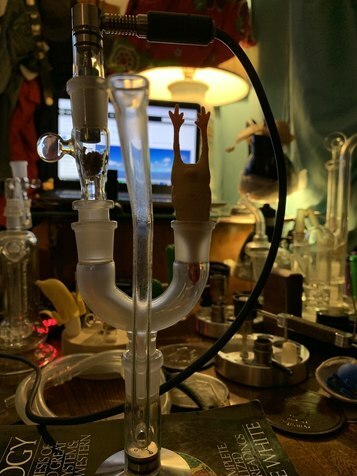 Using the 14 funnel bowl, with the solid glass screen, through a U “Freddie” adapter and the beautiful stand/j-hook/pipe. Flavorful hits using whole nugs. Zancru, you da man! That my friend is the most impressive lineup I've ever seen! So many choices to get medicated...that's the stuff of dreams Zanman! Ok so Sebastian says you can take injectors and sunk them up until it gets up to the wires. DO NOT GET WIRES WET. only metal, ceramic and glass stuff. Personally I would only do this when necessary. But yeah Iso is fine but not the wires. hey bro. Its a great vape no question. 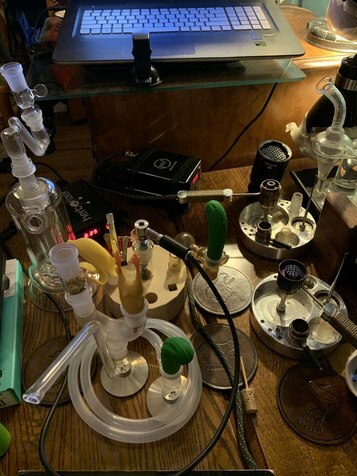 If vapor quality and deep relaxing, but not lethargy inducing, or sedating like the vapcaps- just very relaxing and settling, its a top choice and hard to beat Im sure. Like I have emphasised many times I seriously feel the Ti offers superior medical benefits and is very "penetrating" in that sense. I really have no idea why there would be such a variation between different vaporizers and how medicinally effective they are at delivering the beneficial, healing and modulating plant compounds but there is some bizarre alchemy going on and there is a genuine difference I happen to be particularly in tune with my body when it comes to how different foods, substances and in this case devices affect me in very subtle, particular and specific ways. And I think this is really so important for people to understand you can choose any vaporizer out there that you like and there are many excellent ones which will work for you recreationally but when you invest in a desktop like this or a similar device in my strong view you will automatically be receiving significantly greater benefits from the medicinal side of your herb usage every single time you use the device. And really we should start out with that as a priority especially these self-proclaimed medical users many of which I know rely solely on the vapcap every day of their lives and consider themselves to be receiving maximum medical benefits from their plant consumption which I know is nowhere close to being the case with many other vaporizers commonly used although they are still very good for what they are nothing wrong with them at all, just not the most medicinally effective and Powerful devices. I have to book my return again, procrastination has been on top due to fatigue etc. It was just such a let down and anticlimax before to finally receive it back repaired and just see it working momentarily before it died again so it's like "ok send it back again and in 3 weeks time we'll try again". Haha, that just wasn't enough incentive with promise of immediate gratification to motivate me yet. I second that the effects are hands down better than all my other vapes. Flavor Is excellent. This is my favorite vape for effects for sure. I also added one screen on top of dimples for smaller loads. wicked, really glad you like it so much. Yeah the XL has been flying under the radar for many years as another very underrated, or more like- undiscoverered vaporizer. It has definitely not received the attention and recognition it deserves. And like I was saying, my good friend Dave still prefers the XL to his Ti. Dave bought his XL in 2011. He has used it almost every day since, in normal life times at least. Plugged in from 5 or 6 pm until midnight, longer on weekends. It has never failed him, or let him down. And if it did, Seb will sort it out. So Herbos are a good investment in that sense. That is interestong what you say about feeling the medical efficacy of the XL. I won't dispute that at all, bit this is what I mean, for me the Ti has always really stood out and made an impression on me here, noticeably more so than the XL and actually every other device I have used, although the Flowerpot is very close. And I would imagine the MV1's vapor has a very high and effective medicinal profile, regardless of subjective recreational effects. Yes @Ctipp22 that mod with the screen above the dimples does work. Its only a very short raise but it makes a big difference. You only need to cover the screen that way and you can get pretty instant vapour production and fairly quick extraction as I'm sure you are finding out. Are the Makers of Herbalizer up and running? No, they are dead as far as I know. What's being discussed here is the Herborizer....from EU, I believe. Minor difference in spelling. my problem is...i think all three are soooo good !!!!! i need them all !!! Thanks for clarifying that. Never good news to see a company fail, people lose jobs etc.. those people who shelled out big bucks are not pleased. 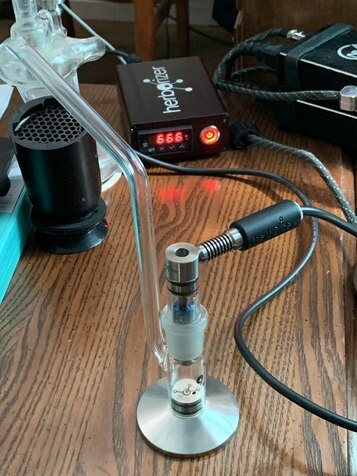 I normally do not suggest eBay, but if you need parts from company's that aren't around, they do carry many parts for vaporizers. Be careful it is eBay. Hey, curious on if anything ever happens to the Herborizer or it stops working what do you do? Mine is 100% but just for future reference? Air Flow is determined by the Size of the Smallest Orifice, Regardless of the vacuum/pressure applied to it...it's called "Critical Orifice" ! hey mate. So sorry I only just got to this, been tough on this end. And I ain't sur3 what to say tbh. If my injector stops working, I will fiddle with leads and connections etc make sure everything is right see if there was anything obvious but I won't be taking it apart because I'm not any sort of repair man. It will basically go back to Sebastien for repair. As it did, I had bad luck my first XL injector which came with my package in 2015 was never actually working properly but I didn't realise until I compared it to my friend's Dave's model in 2017 I think. I got my injector replaced on the warranty after Verdampftnochmal confirmed it was not heating up properly, and my replacement injector actually failed later that year. I contacted them again but the Warranty had passed so I contacted Sebastien and he basically renewed the heating element and cleaned it out to brand new and send it back to me with freebies for no cost warranty or no warranty. Beyond that I expect you will be far more handy at DIY jobs than myself and ascertaining what the problem is. Hope its still going down very well. Sorry I can't give you any better advice lol. No problems at all yet so , I just want to keep it that way! oh yes that's what I meant to tell you my friend Dave's injector I'm sure I've mentioned it already has been going strong multiple hours per day since 2011 without any sign of an issue so it's just potluck really whether you get a permanently solid one or a temperamental one. Regardless knowing that the inventor will take care of you no matter what means it's pretty inconsequential long-term. Good good. Plus I take care of my things pretty damn well. It would literally be just from turning it on and off so damage couldn't get too extensive. so how dose Herbi Ti compare to the glass symphony bro? ? I got a herbi. Is it worth getting the symphony aswell? A Glass Symphony imo is a very potent vaporizer. Very worthy to have, if you have extra $ to spend. You need big lungs, because of a very free flow airflow/airpath. You’ll not be disappointed at all. I use it mostly at night, to knock me down immediately, before going to bed. It’s the kind of desktop vaporizer, that will make your eyes tear, make you sweat, and choke. Any NV Flower Pot will do the trick as well. ShowerHead, WeedEater, or VROD, they all hit as hard and flavorful. Hard to tell the differences, without going through them at the same moment, with the same strain, and rig, and many other variables.